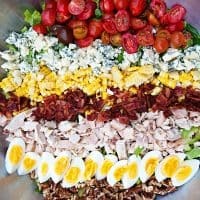 This Southern Cobb Salad with Sweet Onion Dressing is full of delicious ingredients, and a great dish to bring to a party or potluck! 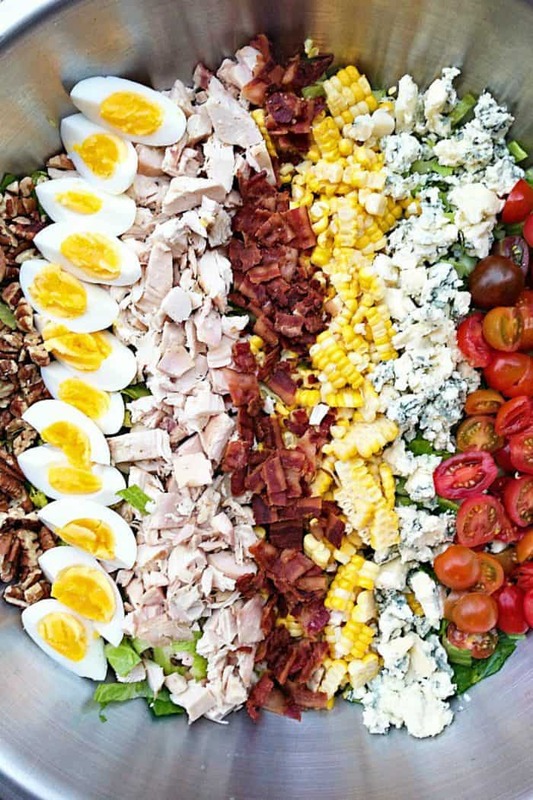 Enjoy this Southern Cobb Salad with Sweet Onion Dressing, so delicious any time of year. I love bringing this salad in a giant bowl to a potluck because everyone loves it. 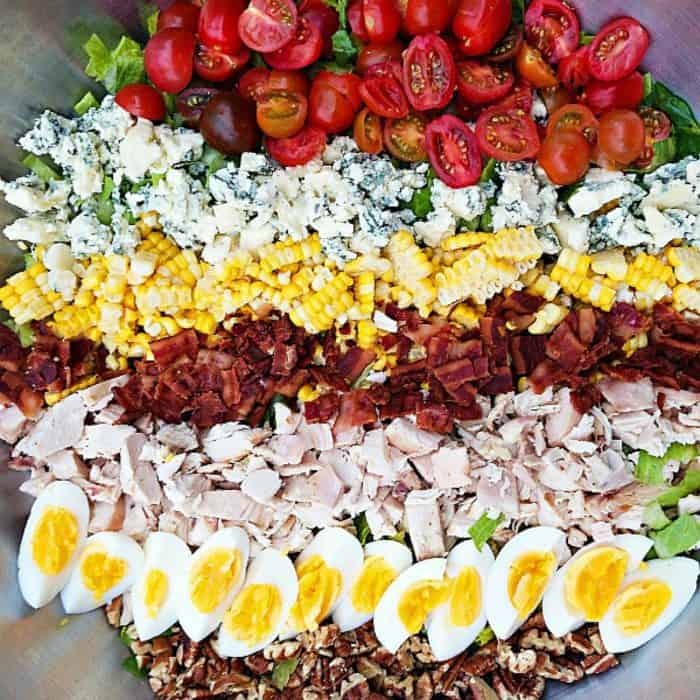 The Cobb salad is a usually an American garden salad that is served as a main dish. But it also makes a great potluck dish to bring to a party. 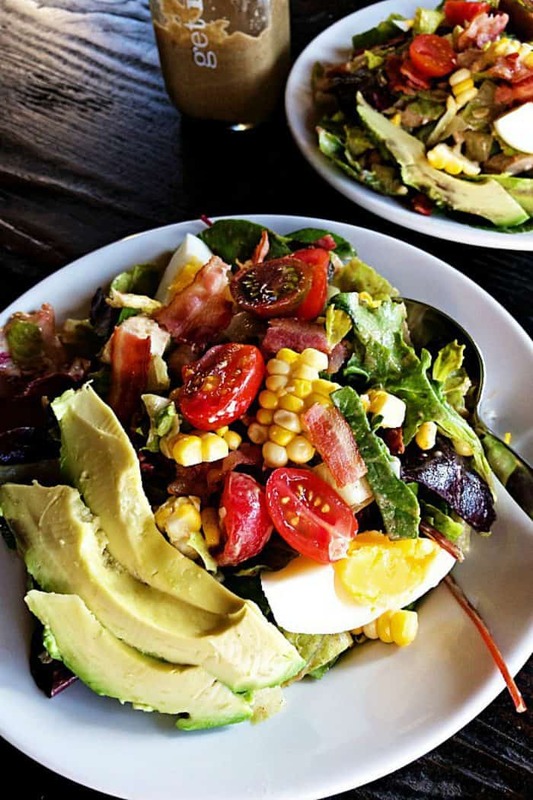 Typically a “cobb” is made with chopped salad greens (iceberg lettuce and romaine lettuce), boiled eggs, tomato, a protein (turkey, salmon, or chicken), avocado, chives, Roquefort cheese (blue cheese), and red-wine vinaigrette. Last night, as the snow was coming down, we were nestled together with friends in town, sharing a meal. I was looking at the beautiful hostess, holding and juggling her baby on her hip, as she was greeting and hugging guests. Hair pulled back, comfortable in her own skin, wise and mature beyond her years, hospitality in her eyes. She and her husband live and breathe hospitality. Every week we gather with new friends in their home, usually with a theme for supper in mind (this week – southern cooking! ), and the night is rich and full. Babies are put down to bed, we eat, sit and talk. We end with communion, a large piece of bread and a cup of wine. And then we talk some more. When I think about food, and what it means to us–as a society, as friends and family, and as a community–beyond nourishment, it really does changes our lives. I’m sure you have your own stories of sharing food and recipes with others in your home. Or being invited to a home for dinner. Seeing the way that other people entertain always makes me smile. No matter what your style, or what you are serving, life is definitely best shared with company, eating together. 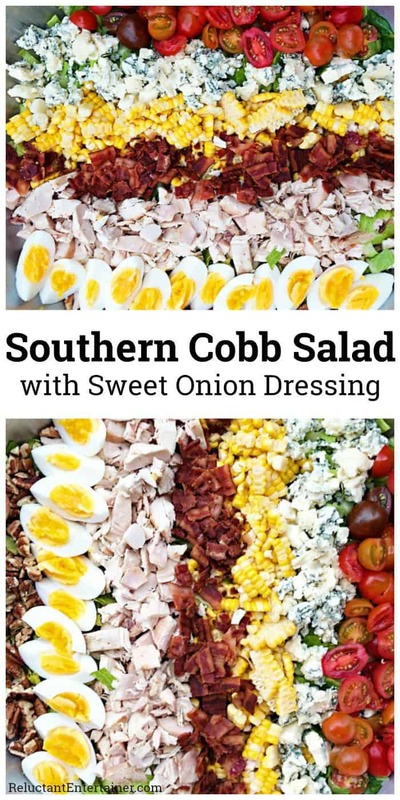 Having the ingredients in my fridge to make a delicious Southern Cobb Salad with Sweet Onion Dressing, I knew exactly what I was bringing to the potluck. A large salad bowl is best for a potluck salad, because we all know when you fill a salad to the brim, it’s messy and hard to toss and serve, right? 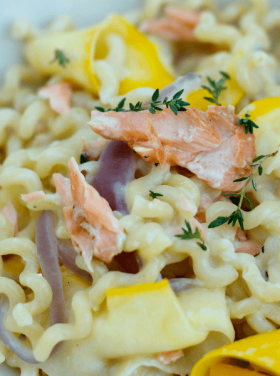 Make the dressing, flavored with sweet onion and garlic, in the blender ahead of time. 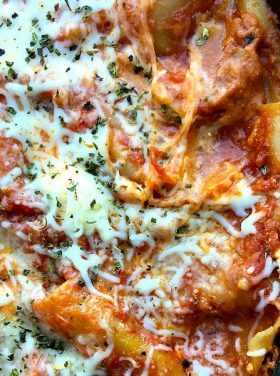 You can double the recipe, and refrigerate for up to 4 days! It’s a pretty salad (toss the greens only ahead of time, and then arrange the remaining ingredients in rows on top, ready to serve!) Or, you can arrange the salad and pass the dressing at the table. For this night, my salad paired well with the chicken, grits, and comfort mac and cheese potluck dishes that were brought to our dinner! YUM! 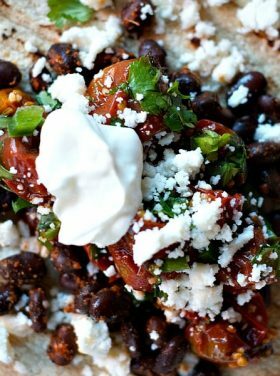 I double this recipe when bringing to a potluck! Heat the 4 Tbsp. olive oil on medium heat in a large frying pan; saute the garlic for 1 minute; add in the chopped onions. Saute on low for 10-12 minutes until tender. The onions and garlic may be lightly charred and soft. Allow to cool. In a blender, add the onion mixture, olive oil, cider vinegar and lemon juice; puree until smooth. Salt and pepper to taste; chill until ready to serve. In a large bowl, add the lettuce. Arrange the remaining ingredients in rows over the bed or lettuce for a pretty presentation. Serve with salad dressing on the side. Or, toss the greens ahead of time with dressing (according to how many greens you use), then layer the remaining ingredients (see photo above). A Cobb salad is one of my favorites, had one this week. Your dressing sounds like a great accompaniment and I can’t wait to give it a try. I love the sound of that dressing! Hi, Sandy. I can’t tell you how much I love your blog! You are a kindred spirit in so many ways, and in particular in your view of the important ministry of hospitality. So, thank you for your words of encouragement, beautiful photos, and WONDERFUL recipes! I read this post with such interest because my husband and I have thought of doing just what you described above. I wonder, would you be able to share a list of some of the themes your group has used as a springboard for your dinners? I’d love the inspiration!